The 2017-2018 college basketball regular season has come to a close. Welcome to Champ Week. It is Conference Tournament time. Last week, 13 conferences began their Tournament play and a number of teams have already clinched spots in the NCAA Tournament field. Earlier this week I broke down the resumes of the 22 teams that enter Champ Week on the Tournament Bubble. We are less than a week away from Selection Sunday and 19 more tournaments will take place this week. Of those, 13 will be from Mid-Major leagues, which I previewed yesterday. Today’s preview covers the six Major conferences where most of the NCAA Tournament teams will come from. As we head towards Selection Sunday, make sure to bookmark our Conference Tournament Tracker to follow along with who has secured automatic bids and what teams are still alive in their respective tournaments. Additionally, I’ll be updating my Bracket Projection much more frequently as we move closer to Selection Sunday. Recent History: This is the fifth year for the American Athletic Conference after the breakup of the Big East in 2013. SMU has won 2 of the last 3 AAC Tournaments, both as the #1 seed. UConn has appeared in 3 of the 4 AAC Championship games. Preview: Three AAC teams should feel fairly secure in their spots in the NCAA Tournament field. Cincinnati and Wichita State could both find themselves on the top four seed lines on Selection Sunday. Houston does have two bad losses on their resume, but the Cougars have enough good wins that as long as they avoid an upset loss in the tournament they should find themselves playing next weekend. The top two teams have a distinct contrast of styles. Cincinnati has one of the top defenses in the nation (57 PPG) while Wichita St has one of the highest-scoring and most efficient offenses (83 PPG). Houston ranks in the Top 35 in both offensive and defensive efficiency and is a threat to make a deep run. Temple scored some big early season victories but have faded out of the bubble picture down the stretch. SMU is the defending champions and the fourth-best team in the conference according to KenPom.com where they rate in the top 100 in both offensive and defensive efficiency. Fourth-seeded Tulsa ended the year on a strong run where they won 8 of their last 9 games. Tournament Format: 14 teams qualify with the top 4 receiving double byes to the quarterfinals. The bottom 6 teams play in 3 play-in games. Recent History: Either Duke or North Carolina has appeared in every ACC Championship game since 1997, a streak of 20 straight years. 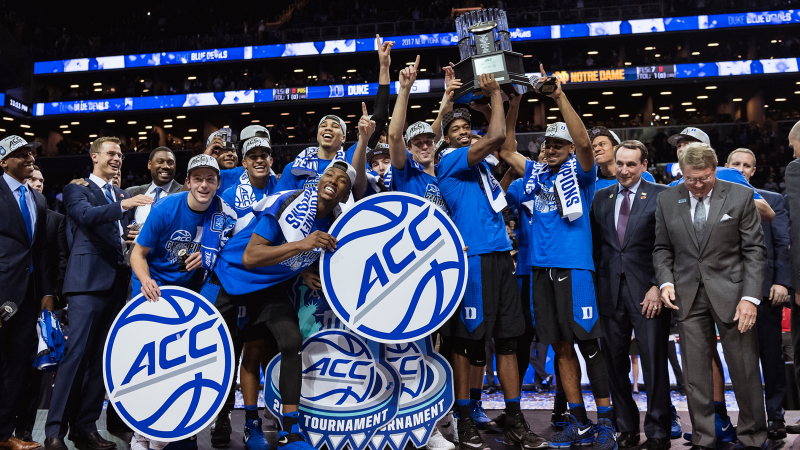 Duke has won 11 titles since 1999, including becoming the first ACC team to ever win 4 games in 4 days last year. Preview: The ACC has a deep league this year and any number of teams are capable of winning the title. Virginia won the regular season title by four games thanks to a mind-numbingly boring pace. The Cavaliers had the best defense in the nation (53 PPG) and an efficient offense. Duke finished 2nd after storming back to defeat North Carolina in the season finale. The Blue Devils are led by a talented freshman class headlined by big men Marvin Bagley III (20.7 PPG, 11.2 RPG) and Wendell Carter (14.1 PPG, 9.1 RPG). Senior Grayson Allen (15.5 PPG) has taken over point guard duties in the last month for the Blue Devils who have abandoned the man-to-man defense Coach K relied on and gone to a 2-3 zone which dramatically improved their defense. UNC’s loss to Duke dropped them to the 6-seed, but they remain in the conversation for a #1 seed in the NCAA Tournament if the Tar Heels can win the title in Brooklyn. Clemson, Miami, NC State, Florida State, and Virginia Tech should all find themselves in the NCAA Tournament field. Louisville and Syracuse are sitting squarely on the bubble. Both have good computer numbers but are lacking in quality wins. Fortunately, the ACC Tournament will give them plenty of opportunities to add good wins to their resume to get into the field. Notre Dame is somewhat of an outlier because Bonzie Colson missed much of the year with injury. Colson returned to the lineup and if the Irish can make a deep run in the tournament they could be an interesting case for the Selection Committee. Tournament Format: All 10 teams qualify with the bottom 4 teams playing in 2 play-in games followed by a normal bracket. Recent History: Since the breakup of the old Big East in 2013, this is the first time in 5 tournaments that Villanova is not the #1 overall seed. Villanova has appeared in the last 3 Big East championship games. Seton Hall has been the only team able to beat the Wildcats in the conference tournament. Preview: Villanova swept Xavier in the regular season but the Wildcats lost a road game to Creighton in mid-February which ultimately cost them the regular season title. The top teams in the conference are loaded with offensive firepower as Xavier, Villanova, and Creighton all average over 84 points per game. National Player of hte Year Jalen Brunson (19 PPG, 3 RPG, 4 APG) leads a Villanova team that is nearly a lock for a #1 seed. St John’s Shamorie Ponds (21.6 PPG) led the league in scoring and keyed back-to-back victories over Duke and Villanova in early February for the Red Storm. The middle of the pack (Creighton, Seton Hall, and Butler) should all make the NCAA Tournament, but their seeding is up in the air and could fall anywhere between the 6 and 10 lines. Providence has the best wins of any bubble team (over Xavier and Villanova) but also has 3 losses against Tier 4 opponents, which lands the Friars on the bubble once again. Marquette is also fighting for their bubble lives but the Golden Eagles lack a signature win on their resume. Tournament Format: All 10 teams qualify with the bottom 4 playing in 2 play-in games followed by a normal bracket. Recent History: Kansas has won at least a share of the Big XII regular season title each of the last 14 years. That success has not translated in recent tournaments as Iowa State has won 3 of the last 4. Since the inception of the Big XII tournament in 1997, Iowa St (in 2014 and 2017) has been the only team to win the tournament seeded lower than 3rd. Preview: The Big XII will be at the center of many bubble discussions this week. Kansas, Texas Tech, West Virginia, and TCU are all safely in the field. The Big XII could get as many as 8 teams in the field, but after the top 4 all the others have significant question marks. Kansas St doesn’t have an elite win and played a terrible non-conference schedule but hasn’t lost any bad games. Texas has a lot of losses in total, but not many bad ones and a few good wins. Baylor has a better win than K-State and no bad losses but like Texas has lost a lot of games. Oklahoma suffered a big losing streak but also has a ton of very good wins. Oklahoma State has an RPI well below where the Committee usually awards at-large bids but have 2 wins over conference champion Kansas. Kansas, WVU, TCU, and Oklahoma all average over 80 points per game with the Sooners featuring the nation’s leading scorer in Trae Young (27.5 PPG, 8.9 APG). The Big XII also has 4 teams that rank in the Top 20 in overall efficiency at KenPom.com. Kansas’ Devonte’ Graham (17.6 PPG, 7.2 APG) was a first-team All American while West Virginia and Texas have two of the best shot-blockers in the nation in Sagaba Konate and Mo Bamba. Recent History: Oregon has appeared in the championship game in 3 of the last 4 years and Arizona has reached the championship game in 5 of the last 7 years. The top seed has only won the Pac-12 tournament twice in the last 9 years. Preview: This has been a strange down year for the Pac-12. Arizona ran away with the league title and is the only team that should feel safe about their NCAA Tournament hopes. Arizona State was ranked in the Top 5 early in the season but fell off, all the way to a 9th place finish. USC, Utah, UCLA and Washington are all hanging around the bubble picture and likely at least 2 of them will get in. Arizona has an efficient offense but a mediocre defense and is led by the presumed #1 pick in next year’s NBA Draft Deandre Ayton (19.9 PPG, 11.4 RPG, 1.9 BPG). UCLA has the conference’s leading scorer in PG Aaron Holliday (20.1 PPG, 5.8 APG). Arizona State is the highest-scoring team in the league (83.5 PPG) while Utah is the only team holding opponents under 70 points per game. Stanford closed the season by winning 4 of their last 5 games and could make some noise in a conference where no one has distinguished themselves other than Arizona. Recent History: One of the top 3 seeds has won the tournament each of the last 8 years. Kentucky has won the lat 3 SEC Tournaments and reached the championship game in 7 of the last 8 years. Preview: Auburn and Tennessee split the league title but only 4 games separated the next 10 teams. The SEC was incredibly tight all season as teams struggled to win on the road. Every team except Auburn, Tennessee, and Florida finished below .500 in true road games while everyone except Ole Miss and Vandy were at least 5 games over .500 at home. Auburn and Arkansas were the top offensive teams, averaging over 82 points per game while Tennessee, Georgia, and Mississippi St held opponents under 68 points per game. After the top two, Florida, Arkansas, Kentucky, Missouri, and Texas A&M should feel secure about their tournament spots and could find themselves seeded anywhere between the 5-seed line and the 9-seed line. Alabama is squarely on the bubble after losing their last 5 games. 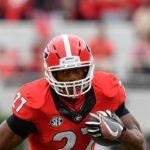 LSU and Georgia have a number of good wins but also some bad losses that hurt their computer numbers. Mississippi St is lacking in good wins but also has avoided bad losses and is hovering around the bubble picture. Georgia’s Yante Maten leads the conference in scoring (19.4 PPG) and is second in rebounding (8.8 RPG) while Alabama freshman Collin Sexton (18.3 PPG) has been sensational. Arkansas has two of the top 4 scorers in Jaylen Barford (17.9 PPG) and Daryl Macon (17.1 PPG). Kentucky’s young lineup started to put things together down the stretch and the Wildcats are absolutely a threat in this tournament.